Distinct, luxurious, professional and affordable chauffeured transportation is what you will always experience with AHCLN – “Your Chauffeured Solution”. Australian Hire Car & Limousine Network (AHCLN) has culminated experience, knowledge and commitment, producing a superior level of service for all. We understand that each and every client’s requirements differ and so does each occasion, event or transfer. Whether you require a premium sedan, stretch limousine, luxury people mover or even a coach, we can find the solution for you. Select our fleet page to review our large range of vehicles and if you still can’t find what you like, simply call or send us an enquiry. Our strength in our team and our network has been achieved by the implementation of our internal induction system. Our policy and compliance department ensures that our team of chauffeurs, meet (if not exceed) both our internal and governing standards. 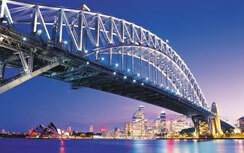 AHCLN offers ground transportation throughout Sydney, regional NSW and surrounding areas. Our dedicated staff will arrange all your transportation needs throughout all of Sydney including: Sydney CBD, Eastern Suburbs, Inner West, North Shore, Northern Beaches, Macquarie, Hornsby, Parramatta, Penrith, Hills District, Campbelltown, Sutherland Shire and Wollongong. To make a reservation simply call AHCLN on 0418-600-353 or Book Online now.